Teachers are one the most overworked and underpaid people out there – I know, I know, “but they get their sumner’s off” – you know your kids as well as I know mine and trust me….. they deserve every second of that summer! 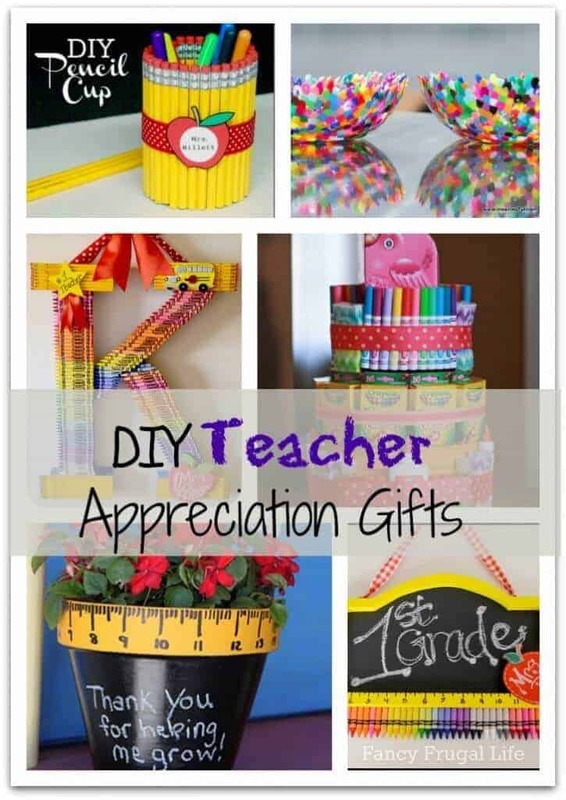 I don’t know about you, but I am always struggling around the holidays, Teacher Appreciation Day and at the end of the year for unique “thank you” gifts for my kids teachers. As always – need it to be reasonably easy and cost effective!! Here are a few of my favorite DIY teacher gifts! I always do a “Teachers Favorite Things List” and send it home with the kids.. Most parents really appreciate it. At the beginning of the year I email a few questions to the teacher to ask them what their favorite things are. They always appreciate it. That is so smart! Thanks for the tip! I’m writing as a retired teacher who could decorate a Christmas tree with ” World’s Best Teacher” ornaments. I’ve always appreciated the sentiment and good wishes that prompts these “teacher” gifts. However I especially appreciated gift cards-your suggested list was right on. Homemade treats are wonderful for busy teacher and a hand-written note from a student or parent is priceless. I have kept those and treasure them. You probably wouldn’t consider giving an administrative assistant a legal pad, pens, or a Staples gift card for a gift. Have the same consideration for teachers and try to spoil them a little. Susan – What a great note! My mom and sister are teachers and helped me with the list. Good to know that the list was on the right track!! Thanks for all you teachers do! We <3 U!! What a really fun round-up. Thank you so much for including my Perler Bead Bowls in this collection. While these are cute, I can tell you after 14 years of teaching and with three children of my own now, these types of crafts are okay, but I feel bad for the time that moms put in to them when we are just as thrilled with a gift card or a bag of chocolate truffles. Even $5 gift cards are so helpful when you are on a budget. Hobby Lobby or any craft store! Great ideas!